OSSSC Jr.Assistant / Jr. Clerk Syllabus 2019: All the applicants appearing for the OSSSC exam 2019 are urged to check out the OSSSC Jr Assistant / Jr Clerk Syllabus provided below. The Syllabus contains all the major topics which will feature in the OSSSC Jr Assistant / Jr Clerk written exam 2019. Alongside the syllabus, we have also provided the official OSSSC Jr Assistant / Jr Clerk Exam Paper Pattern. Since the selection process is carried out in 2 different tests, we have provided the exam pattern and syllabus for both the written exam as well as the skill test. 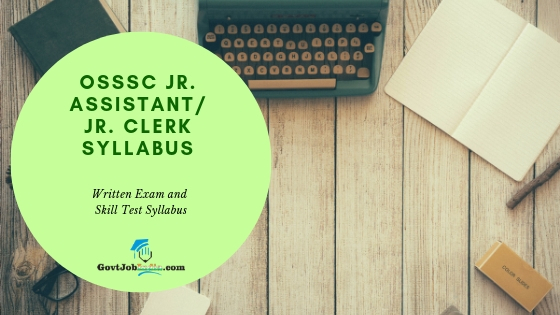 You can also download the OSSSC Jr Assistant / Jr Clerk Syllabus PDF through the link provided below. We recommend that you download the syllabus as this way you will have constant access to the exam syllabus even when you are offline. So without any further ado, let’s proceed to the OSSSC Selection process 2019. Candidates will be selected for the posts of Jr Assistant / Jr Clerk based on their performance in the OSSSC Written exam and Skill test. These two together form the OSSSC Jr Assistant / Jr Clerk Selection Process 2019. Candidates are expected to excel in both these tests if they want to ensure their selection. Check out all the information we have provided below. The OSSSC Jr Assistant / Jr Clerk Written exam will be conducted soon after the Admit Card is released. The exam will feature a 385 mark MCQ question paper. The candidates will have 5.5 hours to complete the exam. Check out all the details regarding the OSSSC Jr. Clerk/ Jr.Assistant Exam Pattern provided below. All candidates who clear the JA / Jr Clerk Exam will be eligible for the OSSSC Jr. Assistant / Jr. Clerk Skill Test 2019. The skill test is the second stage of the selection process for OSSSC recruitment. The skill test will feature 2 papers. The first will be a test to determine the candidates’ skill in letter writing and essay writing. The second will be a test of the candidates’ knowledge of basic computer skills. Kindly have a glance through the OSSSC Jr. Assistant / Jr. Clerk Syllabus PDF 2019 provided below. The syllabus provided here comes directly from the syllabus that is prescribed by the OSSSC in their official notification PDF. It is recommended that you download the OSSSC Junior Assistant / Junior Clerk PDF which is linked here. This is because having offline access to your syllabus can be highly beneficial. All the best for your OSSSC JA and Jr. Clerk Exam 2019. Hopefully the OSSSC Jr. Clerk and Jr. Assistant Syllabus PDF provided here have been of help to you. Feel free to direct your doubts to us in the comment section below and we will help you at the earliest!